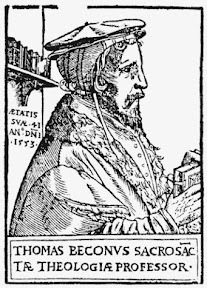 So who was Thomas Becon (or Beacon)? – if you haven’t heard of him I’m not surprised, neither had I, though he led an interesting life, which included being a Royal Chaplain, being imprisoned in the Tower of London, fleeing abroad and he is believed to have written and influenced Cranmer in the writing of the Prayer Book. I said “virtually all” that I knew of the ancestors of my paternal grandfather were from Kent: Thomas Becon and his wife were the first exceptions I came across. Thomas was from Norfolk and his wife (Elizabeth Godfrey) from Winchester in Hampshire. Thomas’s descendants Isabella Becon married Richard Hunt in Lenham in 1724/5, and Richard’s great granddaughter Sybella married Charles Goatham – Sybella and Charles being my gt gt grandparents. Learning of Thomas came as something of a surprise: Sybella’s father was a labourer, though his father and grandfather were artisans (carpenters). I have created a Google map with information about Thomas Becon – click through the icons in the menu on the left of the map if you wish to read the information in chronological order. “Writings of the Rev. Thomas Becon” published in London by the Religious Tract Society – undated, probably C19th. Fourteen pages “Some particulars of the Life of Thomas Becon” precede various selections and extracts from Thomas’ prolific writings. Thomas’ will: I have a copy – short and not very informative – I will add a transcription to this site when I have time. Prayers and other pieces of Thomas Becon, S.T.P. Basil followed in his father’s footsteps, firstly going up to Cambridge and then in being ordained. Again, I have constructed a Google map showing the places associated with Basil – though these are less dispersed than for his father. Basil spent the latter half of his ministry in Waltham – I visited the Church there in 2006 and took a few photos. Sadly, not of the memorial to Basil – not surprisingly I didn’t see this as I read it was barely legible by the time it was transcribed in the C18th; I am grateful both to the original transcriber and those who have now put this information online. Detail is included in my notes on Basil in my tree. It includes a description of a coat of arms on the stone – wondering if this would still be visible even if the words are now illegible I thought I would keep an eye out for it when visiting Waltham again in 2011 (to ring the bells). But the stone was described as being in the middle of the church – and a red carpet ran down the middle of the church! I suspect, in any case, that the floor has been relaid since 1638. Information on the CCED (Clergy of the Church of England database) website – more on it here about Basil Becon. Ancestry.co.uk has the information from “Alumni Cantabrigienses” by Venn, J. A., CUP, 1922-1954. The Becons were will writers – 4 of the 5 generations I believe to be lines of descent from (from Thomas to Basil , father-in-law of Richard Hunt) left one; I have copies of them all but deciphering and transcribing may take me some time – and in the case of the above Basil the will is in Latin and I’ll need some help with the translating! Progress-to-date can be found here.